Join The New Vanguard II featured artists Brooks Salzwedel and Seth Armstrong this weekend, Sunday, December 16th for talks with these at Lancaster MOAH. 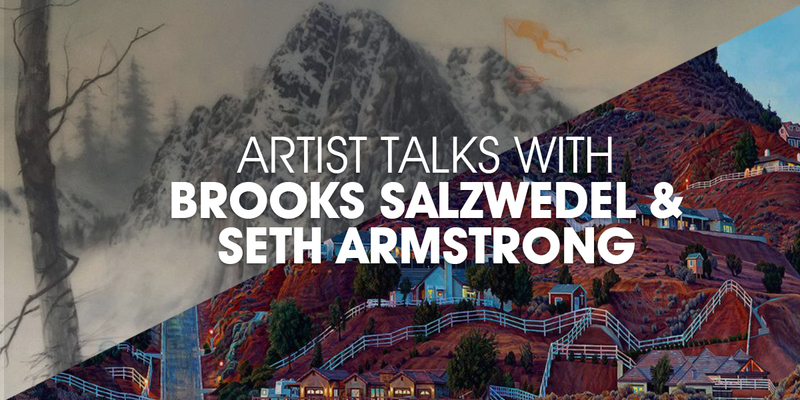 Brooks Salzwedel’s artist talk will take place at 1 pm followed by Seth Armstrong’s talk at 2 pm. 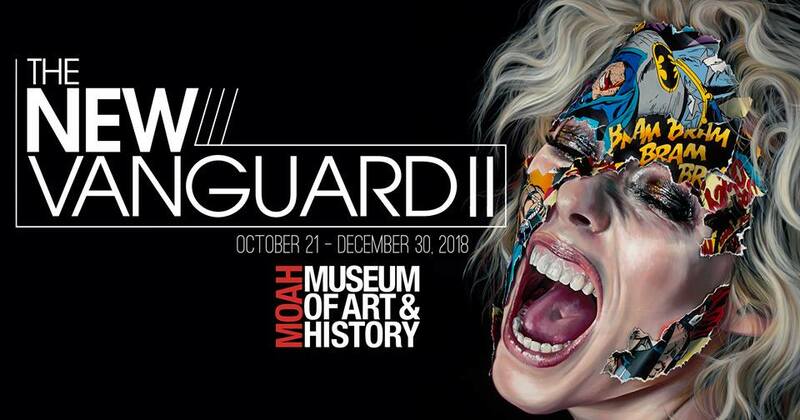 The New Vanguard II will be on view until December 30th and this is a great opportunity to view the exhibition and learn about the works of these talented artists. Hop in your car and join us in Lancaster this afternoon as Craig “Skibs” Barker will lead a walk-through of his exhibition, Suzy is a Surf Rocker today, November 25 at 1 pm followed by a walk-thru and talk with Spenser Little at 2 pm. Barker has been immersed in both the punk rock and surf culture of southern California since the early 1980s. His imagery, being informed by the print media and graphics of the subcultural terrain shaping the time period, reflects this upbringing. Influenced and surrounded by punk flyers, album covers and surfing magazines, Barker began testing his artistic skills by initially making flyers and t-shirts for his punk bands and his friends. Barker’s work explores the junctions between past and present, memory and imagination, fantasy and reality, while creating a dialog between image and viewer. Barker’s most recent paintings infuse his long-standing love for painting and rendering the human female figure with his punk-fueled graphic design aesthetic. Mixing different approaches, techniques and mediums, he creates a sense of memory, personal history and appreciation for the female form. Combining elements of pop culture and literary censorship, he creates layered scenes of voyeuristic playfulness. His artworks feel surreal and partial, yielding results of decontextualization. The way Barker frames his figurative subjects, his compositions feel like spontaneously taken polaroids. 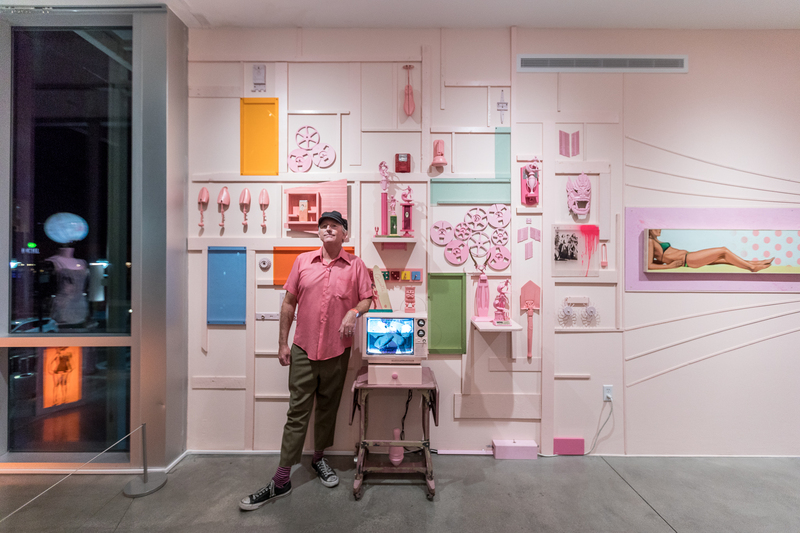 Born and raised in Huntington Beach, Barker has been exhibiting installations and his paintings in places such as Long Beach Museum of Art, Thinkspace Projects Los Angeles and was featured at MOAH in 2014. His work has been included in Newbrow and Juxtapoz magazines. 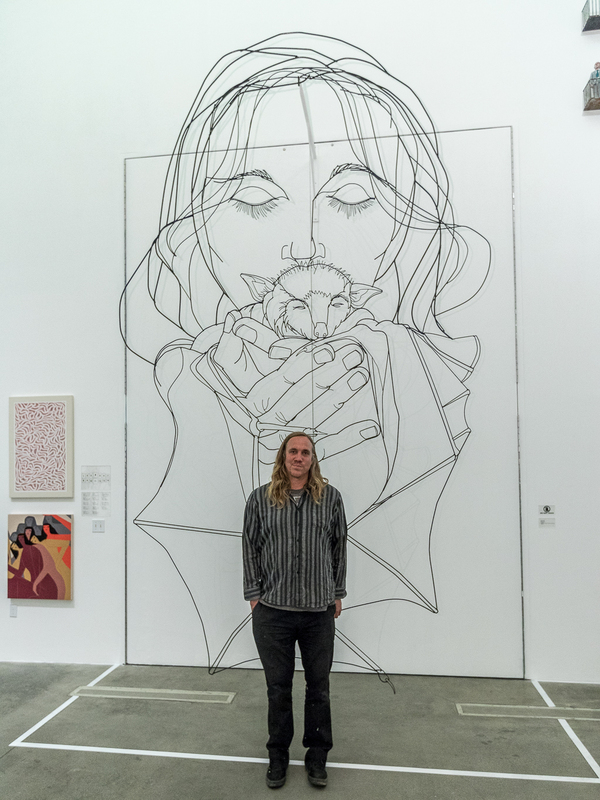 Spenser Little is a self-taught artist who has been bending wire for the last 15 years, allowing his creativity to morph into images that range from simple wordplay to complex portraits. He has related his wire work to a mixture of playing chess and illustration, as the problem-solving component of the work is what continues to inspire himself to create larger and more complex pieces.